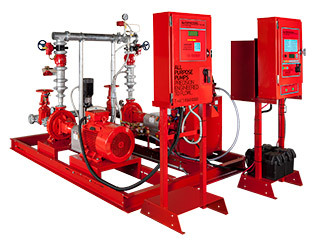 Fire pump systems are an integral part of any fire protection system. Fire pump systems are high-pressure water systems designed to drastically improve the fire-fighting capacity of a building through providing powerful water flow to suppress fire hazards. Fire pump servicing, inspections and maintenance is crucial to ensure that your premises are fully equipped if a fire emergency situation arises. Failure to correctly service your fire pump can result in faulty operation potentially impeding your fire protection measures. At Integral Fire Protection, our technicians will carry out fire pump servicing and notify you of any failures or damages identified in the system.